I am a former Police officer, joining in 1996 as Special Constable, before serving full-time in 999 response and roads policing across South Worcestershire. I left the Police in 2010. SC/CTC cleared since 1996 and like all ADI’s hold an Enhanced CRB/DBS Certificate. As well as working as a freelance Ambulance Response trainer, I was a RoSPA Senior Tutor with the West Midlands Group until it dissolved in 2017 and recently joined the RoSPA Gloucestershire Group as a tutor. I am currently the Chief Observer of the Worcestershire Advanced Motorists IAM Group, and carry out the same role for cars with Gloucestershire Advanced Drivers and Riders I setup the advanced driving scheme for 18-25-year-olds, and have taught 11-17-year-olds, off road for a commercial provider. In addition to my Police and Ambulance experience, I am rated by the Driver and Vehicle Standards Agency, (the body that regulates instructors) as Grade A in instructional ability, (which alone puts me in the top 24% of instructors nationally*). I have also taken the optional DVSA Special Test for instructors at their Cardington HQ, receiving a Grade A.
I also hold all the recognised civilian advanced driving qualifications, from the organisations running the tests, (RoSPA, IAM ,DIA, DVSA), as well as where applicable the related trainer qualifications, ‘train the trainer’ qualifications and have also qualified or trained as an examiner for several of them. DVSA Examiner after a Gold assessment drive with no areas of weakness, identified and I attended a DVSA Examiner Training course at Cardington HQ as well as at a live test centre. I’m also qualified as an IAM examiner, currently, work as a DIA Examiner. 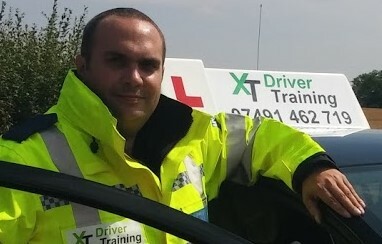 I work with one of the leading national providers, as well as directly to train candidates for the Driving Instructor qualifying tests, as well as those seeking to become DVSA examiners. I am a member of the Governing Committee of the ADI National Joint Council, the largest association of its type which liaises directly with the DVSA, representing the views of thousands of driving instructors across the UK. In 2017 in recognition of my work as a RoSPA Tutor, I was invited to Buckingham Palace to join the RoSPA 100th Birthday Celebrations, and as a VIP to the IAM Event for Observers at Silverstone racetrack. I was also one of only two trainers from Worcestershire to attend the DVSA Workshop at Cardington in the introduction of the new part 3, and was invited to become an inaugural Fellow of the IAM. Photographs of all these events can be found on this website. You can find reviews, details of my latest prices, and pass rate here. Committee Member – RoSPA West Midlands Group until the group dissolved in 2017. Member of WADDI – The Worcester and District Driving Instructors Association.